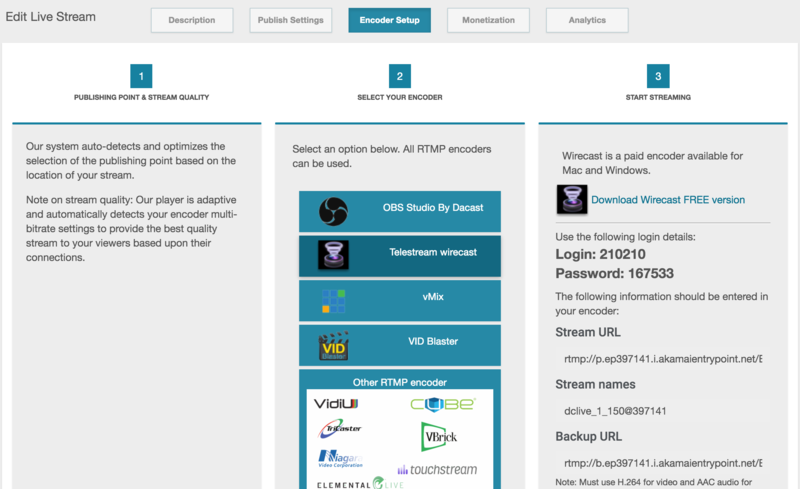 First, it’s important to know that there are 2 possible methods to connect your DaCast stream to your Wirecast encoder. At DaCast, we recommend that you use method #1, but we include instructions for both methods below. Note that it is possible to do multi destinations streaming with Wirecast which means that you can stream on several destinations at the same time. Now let’s dive into Wirecast configuration with DaCast live channels. – Press the keys COMMAND + Y, on Mac. Once the window opens, you next need to “Select an Output Destination”. The destination should be identified as “RTMP Server”. 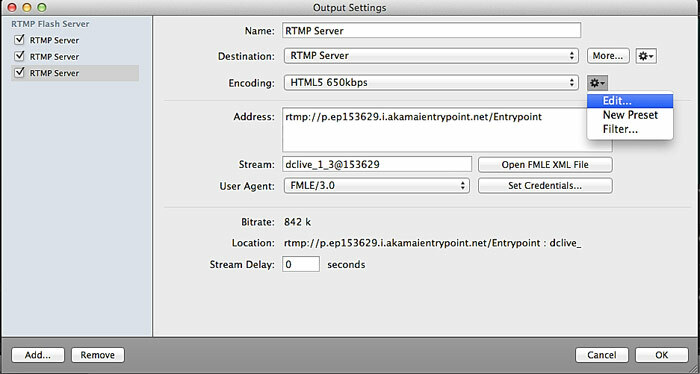 After you select these parameters, click OK.
First, enter the stream URL and the stream name as shown below. Please make sure that the stream is correctly set up for HTML5. To do this, click on the clockwork icon near the ENCODING dropdown and choose EDIT or NEW PRESET. – Width, height, Frames per second, Average bit rate: your choice. 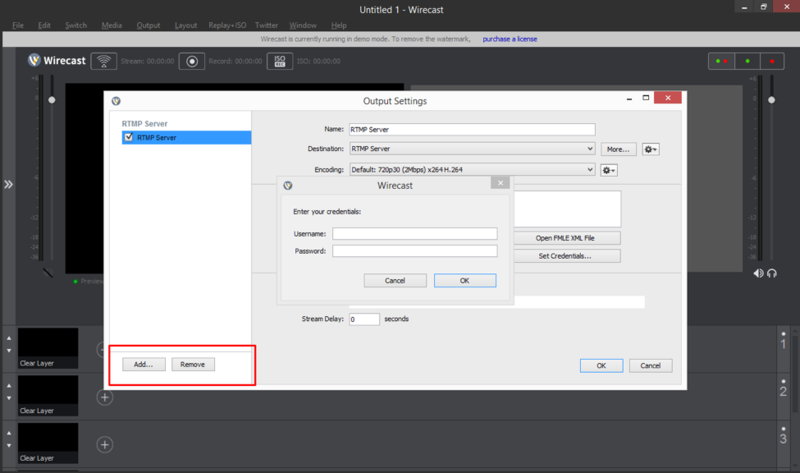 *Please be aware that the default settings in Wirecast 7 are HD settings. Check the frames per second number. Make sure the keyframe every (keyframe interval) is equal to 2 times the Frames per second number. Finally, take a look at the following example (60 = 30 x 2). Enter the credentials in SET CREDENTIALS (6-digit login and password). If you need help setting up your stream, please follow this article which explains choosing sources and other steps. 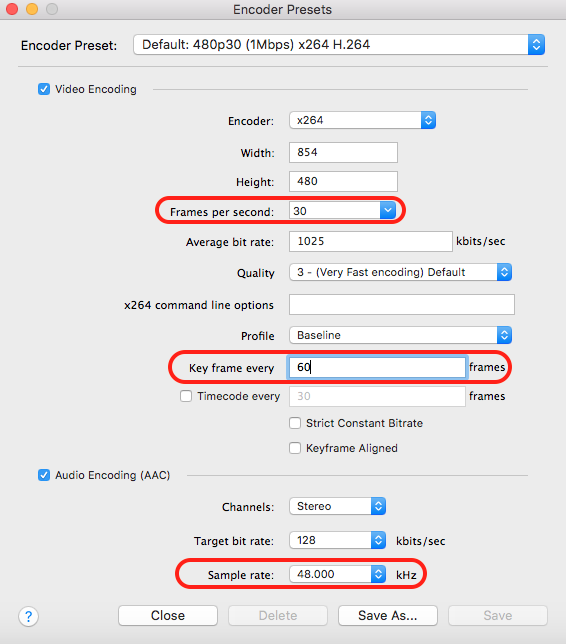 Before getting started, create a live channel and go through the steps up through ENCODER SETUP. Note the name of the live channel that you created. Make sure that the stream is correctly set up for HTML5. To do so click on the clockwork icon near the ENCODING dropdown and choose EDIT or NEW PRESET. Please be aware that the default settings in Wirecast 7 are HD settings. If you plan on doing a single stream, we recommend a standard definition to ensure that your stream will play for all your viewers. Please note that a standard definition is 480p: 854×480, 500 Kbps – 2 Mbps for video, 128kbps (stereo) for audio. 2) Next, make sure the keyframe every (keyframe interval) is equal to 2 times the Frames per second number. 3) Finally, take a look at the following example (60 = 30 x 2). Do you need help setting up stream? If so, please follow this article which explains how to choose sources, as well as other necessary set-up steps.